The environmental consequences of mining Iron Mountain became apparent only a few years after the start of open mining in 1896. Fish kills in 1902 in the Sacramento River, near the city of Redding, were the first documented effects, and shortly thereafter, several private lawsuits and an injunction from the U.S. Forest Reserve (precursor to the Forest Service) were served against Mountain Copper Company for severe air pollution from open-air heap roasting (1897-98) and smelters (1898-1907) at the site, which denuded the vegetation for 14.4 km south, 5.6 km north, 3.6 km west, and at least 8 km east of the smelters at Spring Creek. As the years passed and as operations continued, acid mine drainage and contaminated sediment deposits were added to the list of environmental effects. As a result of acid mine drainage, large quantities of contaminated sediments were deposited on the bottom of Spring Creek and the Spring Creek Arm of Keswick Reservoir threatening fish and other aquatic organisms downstream. More recent concerns arose during remediation activities in 1990, when water samples taken from the seeps in the Richmond Mine revealed negative pH values, making the water some of the most acidic water ever sampled. 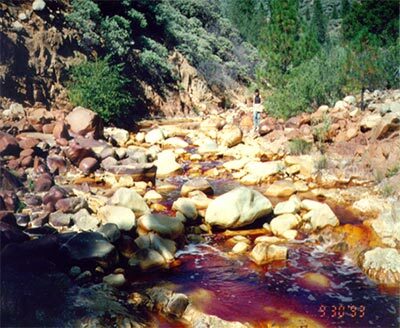 Prior to clean-up operations by the Environmental Protection Agency, acid mine drainage from Iron Mountain was among the most acidic and metal-laden anywhere on Earth. Acid mine drainage (AMD) is metal-rich, acidic water that is the result of water from mining activities flowing over or through rocks containing pyrite, a sulfur bearing mineral. This water reacts with pyrite and air to form sulfuric acid and dissolved iron. The chemical reactions that form AMD are sped up greatly by the activity of iron- and sulfur-oxidizing microbes, including bacteria and Archaea (formerly known as archaebacteria). AMD also further dissolves other heavy metals that are present at Iron Mountain (copper, zinc and cadmium) into ground or surface water. This is of particular concern at Iron Mountain as the AMD is transported to the Sacramento River, an ecologically sensitive water body that hosts several threatened and endangered species of anadromous fish, including steelhead, and types of Chinook salmon: winter-run and spring-run. In addition, the City of Redding (with approximately 90,000 residents) receives its drinking water from the Sacramento River, downstream from the site. An uncontrolled release of Iron Mountain acid mine drainage could potentially threaten the quality of the drinking-water supply. Detailed studies beginning in the 1970s have demonstrated that Iron Mountain produces some of the most acidic waters in the world (Nordstrom 1977, Nordstrom & Alpers 1999a, Nordstrom and others, 2000). Since the early 1980s, these scientific, and engineering, studies have provided the basis for on-site remediation activities, which have substantially improved water quality in the receiving waters. 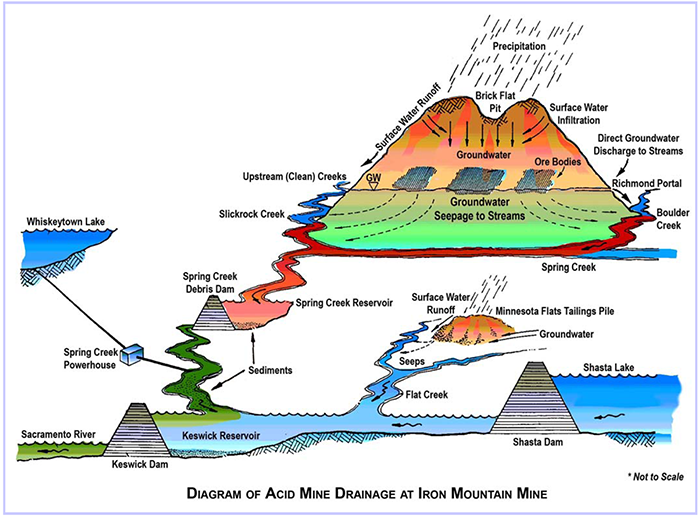 Although Iron Mountain is in some respects a "worst-case scenario" with regard to the formation of acid mine drainage, the extreme conditions have provided a useful laboratory for improving the understanding of hydrogeochemical, mineralogical, and microbiological processes that affect mine-drainage geochemistry. Threatened and endangered species of fish, including steelhead trout, and winter-run and spring-run Chinook salmon, have critical habitat and spawning grounds below the Keswick Dam on the Sacramento River. Beginning with a 1939 survey by Shaw (1940) of copper concentrations, pH, and discharges of acid mine waters entering the Sacramento River in Shasta County, the California Department of Fish and Game (CDFG) made several studies of the aquatic toxicity and fish kills. 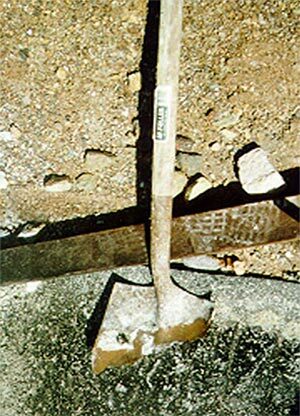 Prior to 1939, the scale of mining and the amount of acid discharge was not as great as it was after WWII because the main excavation of the Richmond mine had not yet been accomplished. In 1942, construction at the spillway site of Shasta Dam was such that it became an impassable barrier to fish migration. A major flush-out event caused by heavy rains in 1955 led to a massive fish kill, prompting the CDFG and the Regional Water Quality Control Board (Central Valley Region) to study the problem in more depth. A contract was let to the Philadelphia Academy of Natural Sciences, whose report was completed in the summer of 1956 (Patrick and others, 1956). Also in 1955, a large wasterock pile failed on the south side of Iron Mountain, causing a landslide that covered the mine portals of the old workings in that area and filled part of the channel of Slickrock Creek to a depth of about 27 m.
Keswick Dam was completed in 1950 and the reservoir that formed behind it became the site of neutralization for the acid mine waters discharging from Iron Mountain through Spring Creek. 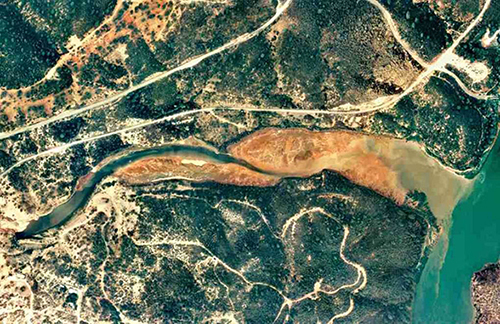 Contaminated sediment has accumulated since the early 1960s in the Spring Creek Arm of Keswick Reservoir (SCAKR), California. The sediment consists primarily of hydrous iron (Fe) and aluminium (Al) oxides that form by mixing of acidic drainage, from inactive copper (Cu)- zinc (Zn) mines and wastes associated with massive sulfide deposits at Iron Mountain, with dilute, near-neutral water from the Spring Creek Power Plant (SCPP). The sediment contains elevated Cu (560 to 1,830 mg/kg, dry) and Zn (385 to 1,120 mg/kg, dry), has pore water with extremely high Fe (up to 2,000 mg/L), and is toxic to aquatic life. During 2009 and 2010, as part of a multi-stage Superfund remediation effort at Iron Mountain that began in 1983, the U.S. Environmental Protection Agency removed about 170,000 cubic yards of contaminated sediment from SCAKR using a high volume suction dredge (> 5,000 gallons per minute). In-line, lime neutralization was used to adjust the pH of the dredged material, which was pumped about 2 miles upstream to a lined dewatering-disposal cell. Benefits of the removal include more flexible operation of the SCPP and lower risk of contaminant metals affecting fish habitat in the Sacramento River below Keswick Dam.